I went on limb and made my own eggnog this year. Living in Israel, this is certainly not something we can find in the dairy section. Despite our Jewish-ness, my very American father would bring home that rare quart carton of Dean’s eggnog. Oh my. He loved it. And he’d come home to find perhaps a half cup left for him… Being raised on no junk food whatsoever, having the eggnog in the fridge was a temptation that was simply impossible to resist. Needless to say, I have a sore, sore spot for eggnog. And how hard could it be? Not hard. I found a recipe by Alton Brown that I kind of played with. Essentially, if you want to do a cooked eggnog (which, believe me, if you want to avoid a nasty stomach bug, you want to do this – especially if you don’t know exactly where your eggs come from), is almost exactly an ice cream recipe. It’s no Dean’s eggnog. This is frothy. Not as custardy. And the alcohol does give it a noticeable kick. In its way, it was satisfying. But the raw egg whites still perturbed me. It tasted so much like egg. Not like the nutmeg-y creamy very yellow custard I was hoping for. Next time, I think I’m going to cook my eggs longer (let them thicken), perhaps use a higher fat cream (or replace more of the milk volume with cream), and certainly cut the egg whites. But that will have to wait for next year. You should try Ruhlman’s eggnog recipe. We had a lot of success and it’s really easy. You can also make individual portions to try out out. I agree with you other recipes are disappointing and it is frightening to drink raw egg but the bourbon/cognac will kill bacteria and if they are pasturized eggs you should okay. 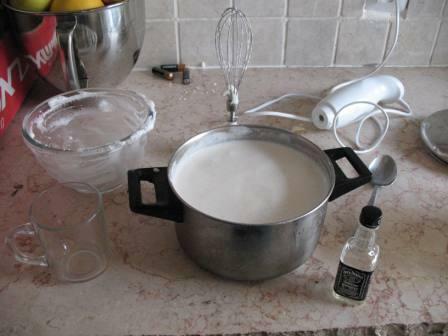 Rocco is planning to make a batch of eggnog to age as an experiment. We’ll keep you posted. This is something else Ruhlman does.